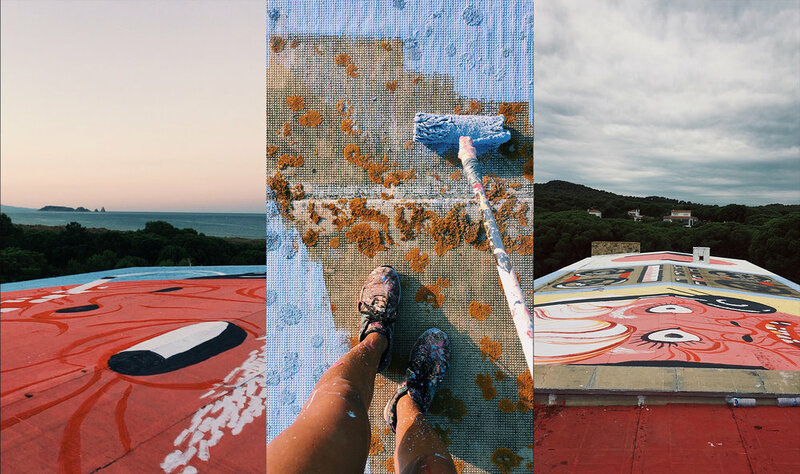 I painted a rooftop of an abandoned radio station, founded by the americans as an anticommunist propaganda source to Soviet Union during the Cold War in Pals, Costa Brava. I painted 2.180 square meters. The idea of painting a small wall on a Saturday morning turned into a 2.180 square meters floor painting. Happy to have pushed me to try a new surface, to have let me enjoy the process, to end the days painting alone with incredible quite sunsets in front of the sea, etc. It was not an easy job to carry all the paints and materials throw the forest to the top of the abandoned building.